SAIL CAR STEM KIT TO MAKE 20 SAIL CARS. Build 20 Sail Cars using inexpensive materials to demonstrate how wind can propel an object. Gather measurements, record changes in variables and use simple engineering design concepts to create sails that can push the car the furthest or fastest. 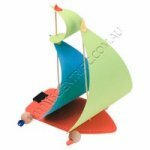 The kit contains enough materials to make 20 Sail Cars and requires approximately one class period.